Meet Up London: Guest list is hotting up! Designers, directors and principals from leading design firms such as Richmond International, HBA London, Gensler, Jestico + Whiles, Goddard Littlefair, Project Orange and WATG are among the names that are confirmed to attend Meet Up London, Hotel Designs’ exclusive Q1 networking event. Taking place on March 28 at Minotti London’s Fitzrovia showroom, Meet Up London will be attended by more than 200 hospitality professionals. 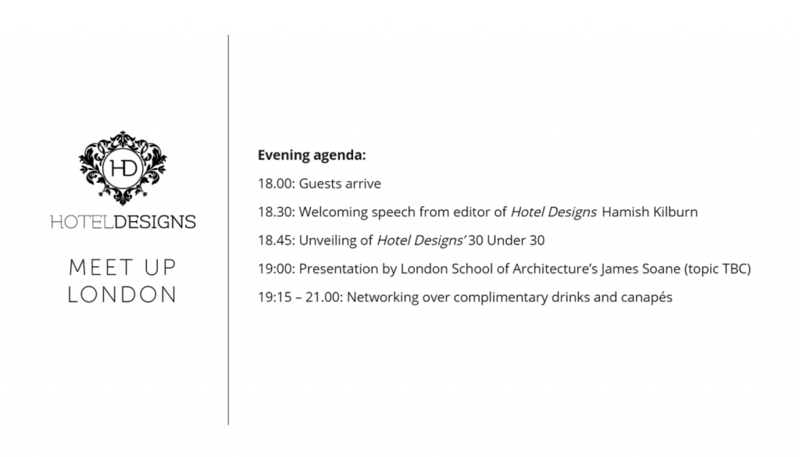 As well as providing the perfect networking stage for professionals who are working on the hotel design scene, the event will also pay special attention to young designers as it will unveil Hotel Designs’ 30 Under 30 (the shortlist can be accessed here).